The countdown to this years annual NuArt International Street Art Festival has begun, were some of the biggest names in the world of street art will descend on Stavanger, a city located on the west coast of Norway. Since 2005, the continued hard work of NuArt's founder and director Martyn Reed along with his teams has seen the festival grow into one of the must see highlights on the street art calendar. Alongside the outdoor street interventions and annual group exhibition (set to open on the 6th September), NuArt has continued to evolve with an ever expanding program of exciting events, workshops, panel discussions and film screening all part of the NuArt Plus series which runs for the duration of the festival. 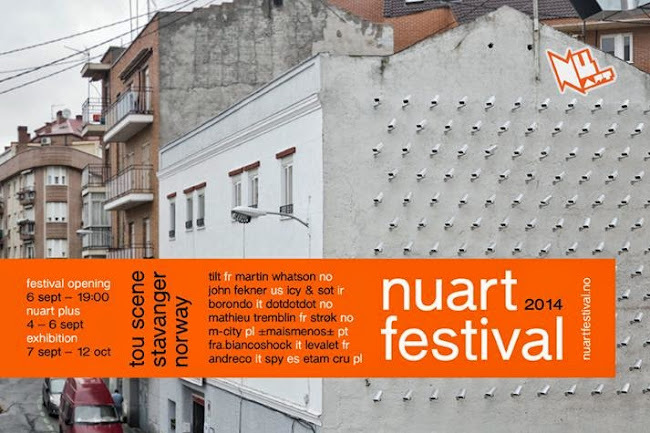 Carlo McCormick, Peter Bengtsen, Evan Pricco, Natalie Hegert and RJ Rushmore are among some of the invited speakers who will be hosting and talking at various events during this years NuArt Plus. Also in attendance is Steven P. Harrington and Jaime Rojo of Brooklyn Street Art who will bring their successful BSA Film Friday's to NuArt Plus with a collection of graffiti inspired videos from around the globe. Other film highlights will include the screening of the Os Gemeos film 'Cidade Cinza'. Nuart Plus talks, debates, film screenings and tours , 4th-6th Sept. The Nuart exhibition opens on Saturday 6th September at 7pm. For a full program of event hit up the NuArt website and check their promo video above.